HARGEISA– Hargeisa regional court passed today sentences to citizens alleged of choosing an illegitimate mayor in Hargeisa. 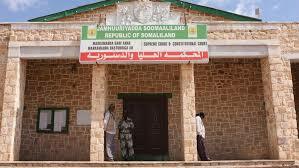 The sentences issued by the court in Hargeisa was confirmed by Marodi Jeh regional governor. Those who have been convicted for acts against the state and having committed a national treason have been under police custody. A traditional elder who was the ringleader of the group who claimed to have chosen a mayor in the south of Hargeisa, Hon. Hasan was put four years behind bars. Mr. Husein Shabel was sentenced to three years imprisonment. Mr. Hasan Kaam Liban was also sentenced to 2 years imprisonment. The court has not found any evidence pertaining to Mr. Abdikani who was accused of being an abetting the criminals.